Many people in rural areas are associated with textile and handloom business. They use looms and weave fabrics, which have a high demand in national and international markets. But the condition of these weavers is not good. Due to the high prices of raw materials, they have to take loans. Most are too poor to repay these debts and often choose some other profession to make ends meet. To assist these weavers financially, the state government of Telangana has decided to pay the credit of weavers. This welfare scheme was announced by Etela Rajender who is the finance minister of the state. 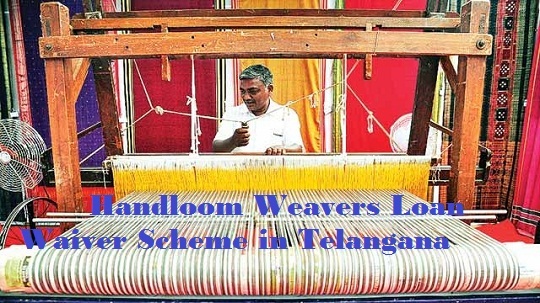 K Tarakarama Rao is the present Handloom and Textile Minister and he was present when this new credit waiver scheme was announced in Telangana. It was announced in November 2017 and the authority will soon start the task of implementing it. K. Chandrashekhar Rao is the CM of Telangana and he will keep a close watch on the implementation of this program. Empowering handloom weavers – By launching this scheme, the state government will assist the handloom weavers financially. Respite from making payments of debt installments will allow these weavers to invest more towards purchasing advanced handlooms. State will repay the credit – The state government has promised to assist the handloom weavers by repaying their credit to the banks. That way, these weavers will become debt free. Amount to be paid by the state – The state authority will pay Rs. 1 lakh on behalf of every weaver who has taken a loan for developing his or her business. Number of beneficiaries – As estimates, the state government will repay the debt of 2,467 handloom weavers. Developing the market and promoting brands –Only helping weavers will not develop the current situation of these weavers. Along with financial assistance, authorities will bring in more financial and resource mobility in the market. Proper marketing and promotional facilities will also be made available. The state will also promote these brands adequately. Solving associated issues – Apart from financial help, the state will also make sure that these weavers get raw materials easily and at low rates. They will also provide developed looms to make their task easy. Assistance for people associated with ancillary industries – Apart from handloom weavers, state authority will also assist ancillary industry workers like people who dye the fabrics and winders. Money in bank accounts – The state will transfer money directly into the bank account of the weaver from where he has taken the credit. Residents of Telangana – Only handloom weavers who are legal residents of this area will be allowed to apply for this loan waiver scheme. They need to produce proper papers to support their claims. Associated with handloom and weaving industry – Weavers who are associated with the traditional method of weaving fabric, i.e. on hand operated looms will be allowed to apply for this debt relinquish scheme. Credit taken from financial institutes – Borrowers from all financial institutions will not be given the facility of having their credits waived off. Loans taken from Cooperative Central banks and nationalized banks will be recognized under this program. Time of credit approval – Weavers who had applied and acquired the credit from above mentioned banks between 1st of Jun 2014 and 31st Mar 2017 will only be allowed to apply for this scheme. Upper limit of credit – Weavers who have taken a credit that is either less than or equal to one lakh will be get the full money from state government. But weavers who have taken a loan more than that amount will also be able to apply but they will get waiver till one lakh only. According to the reports of Telangana finance department, the state government will have to shell out around 10.10 crores to pay the credit taken by the handloom weavers. It will help the weavers by taking the pressure of repaying the debt from their shoulders. Apart from these handloom weavers, the state authority will allocate around 5.65 crore for developing the situation of 1,018 working on power looms. This scheme has been designed for developing the sorry state of the weavers. If they do not have to worry about the payment of their loans, they will be able to utilize this credit amount properly for improving the production.